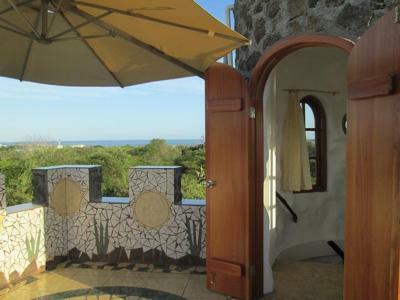 Lock in a great price for La Fortaleza De Haro – rated 8.9 by recent guests! Gianna and Roberto was great hosts and felt like family. The property was off the main street so it was quiet but a little walk to get back. Breakfast was simple and nice, scrambled eggs, fruit and croissants along with tea, coffee and fruit juice. The pool is great! The place was clean and well kept. It’s located on the upper part of town (10 min walk from pier/downtown) but location gives you peaceful, quiet environment. 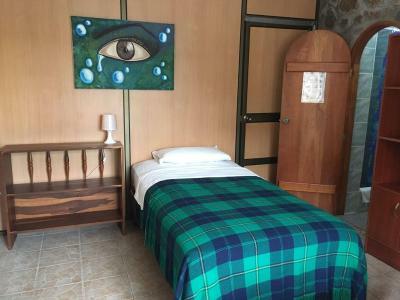 You hear birds sing in the morning, there is oceanview, 10 min to Charles Darwin Research Station, walk to the Ratonera beach and playa de la estación, easy access to other beaches. The host couple Roberto and Gianna are warm and friendly, makes you feel at home. In summary, the highlight of my trip was seeing wildlife so close. Observing sea lions, turtles in their natural habitat. This is a heavenly place. Roberto was a great host and so helpful to us in our excursion arrangements and how to find our way around in a strange and non-English speaking environment. Everything from A-Z was there. Owners were always at your beck and call, just ask. They were informative with taxi's and ordered taxi drivers they knew for cheaper prices. Could order meals in if you wanted. Gianna had a few restaurants on hand. We were well taken care of in every way. Breakfasts were delicious, could vary a bit more, especially in the age of Vegan's. They run a tour agency, which was so easy to book through them. There are so many on the Island that you should be aware of what you want before you come. We were extrmely happy with the 2 tours we booked through them. There other non tour suggestions were super and filled our week. Our accommodations were perfect. Pool was super clean and beautiful. 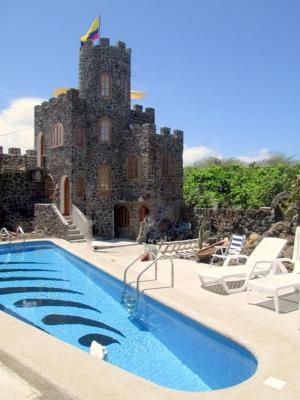 Hotel itself is charming built out of lava rock by Roberto the owner. So much artistic quality wraped up in two packages, Gianna and Roberto. LOVED this place! It is asthetically pleasing while being a good price. The staff are very friendly and helpful. You can't go wrong here! Interesting building, made to look like a castle. 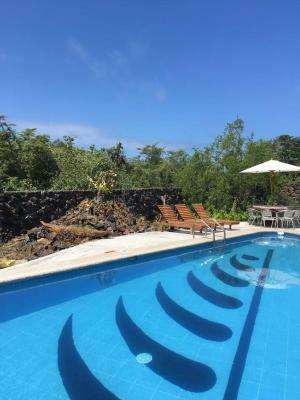 Swimming pool and public areas were comfortable and helped to make for a relaxed stay. Breakfast was good; eggs, juice, bread fruit, coffee, etc. About a 5-10 minute walk to the main street. Owners were very helpful. Breakfast was very good. Staff lovely and helpful. 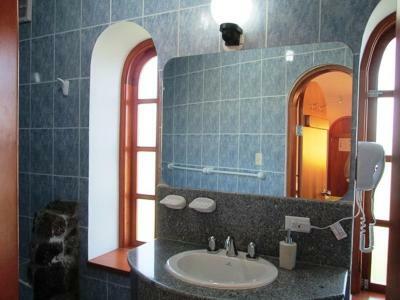 The place was very pretty, fully equipped, big comfortable rooms with their awesome bathrooms. They had things to do to hang out at the hotel: chess, board games, darts, and a very nice swimming pool. Birds love to hang out in the area, which is very nice to watch, specially in the mornings. Beautiful decoration, paintings and sculptures. Very friendly host who went through the places to visit during our time there. Nothing was too much trouble. We were in the "turret" and I would recommend this room. You get a hammock and a private rooftop space for sunbathing. The Lady (owner of the house) was very very friendly. 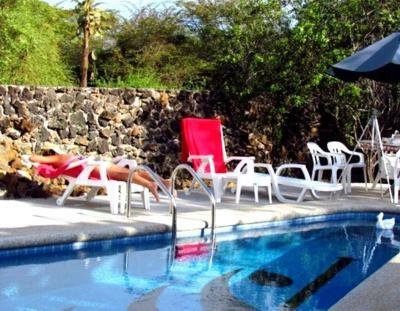 La Fortaleza De Haro This rating is a reflection of how the property compares to the industry standard when it comes to price, facilities and services available. It's based on a self-evaluation by the property. Use this rating to help choose your stay! 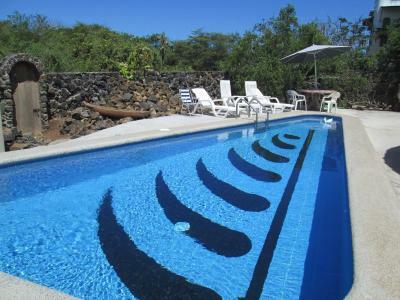 Located in Santa Cruz, 15 minutes walk from Charles Darwin Station and beach, La Fortaleza De Haro offers an outdoor pool and free WiFi access. Guests can also enjoy a free daily breakfast throughout their stay. 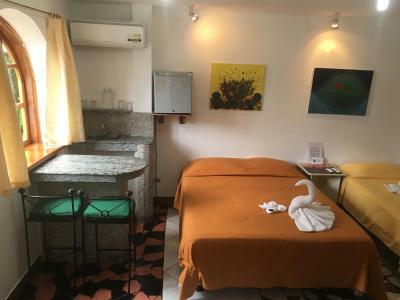 Each air-conditioned room features a cable TV, a private bathroom, with hot water and a hairdryer, and views of the sea and Galápagos National Park. Suites also have a mini-bar. 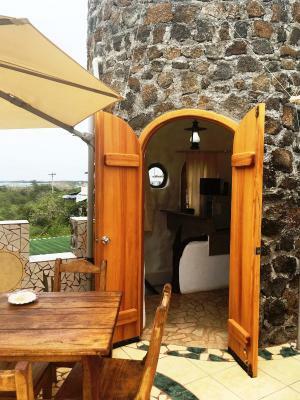 La Fortaleza De Haro provides tours around Puerto Ayora for a fee, such as glass-bottom boat trips around the bay, day trips to other islands, and water sports. Airport transfers can also be arranged for a fee. 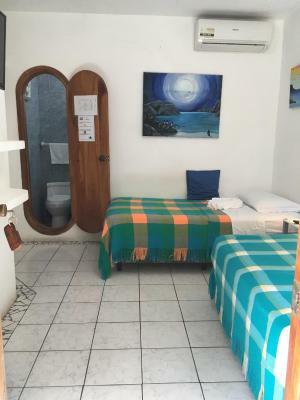 Baltra Airport is 1-hour drive away. 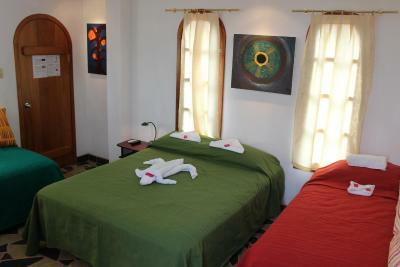 When would you like to stay at La Fortaleza De Haro? 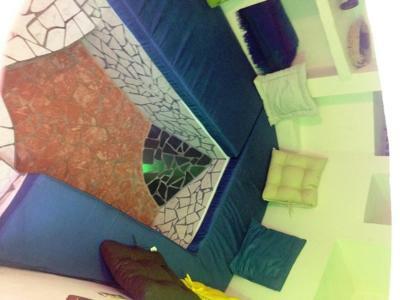 Double room overlooking the pool, sofa, hot water and air conditioning. 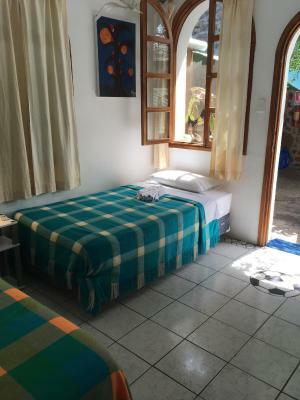 Triple room with pool view, air conditioning, hot water and cable TV. 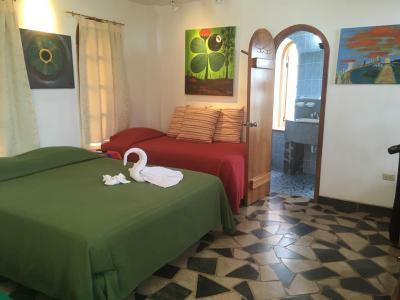 This air-conditioned twin room features hot running water. This suite features a mini-bar, cable TV and sofa as well as hot running water. This suite has a mini-bar, a cable TV and a view of the sea. House Rules La Fortaleza De Haro takes special requests – add in the next step! La Fortaleza De Haro accepts these cards and reserves the right to temporarily hold an amount prior to arrival. 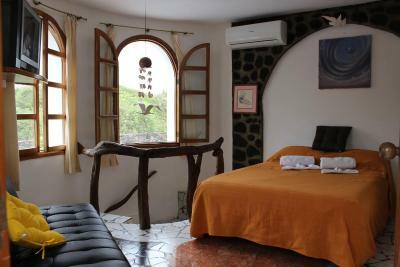 Guests are kindly notified of the fact that Galapagos has a tropical weather and ecosystem. Therefore and especially being part of the National Park, there is a diversity of bugs and animal species, like nonpoisonous spiders, lizards, bees, and ants. The property takes efforts to exterminate bees and ants, but does not intent to kill the spiders and lizards, as they are considered harmless and live in their own habitat. Please note that breakfast is served between 7:30 and 9:30 am. Payments are made trough PayPal, guests will receive a request via e-mail with more details. Please inform La Fortaleza De Haro of your expected arrival time in advance. You can use the Special Requests box when booking, or contact the property directly using the contact details in your confirmation. The WiFi was not good but that is the entire island so this was no problem. The hotel is right beside one of the National Parks (with lots of vegetation). As a result we had lots of bugs, tiny red ants and spiders in our room. I would suggest that screens be installed on some of the windows so they can be opened for ventilation without bugs getting in. The wifi signal came on and off every once in a while. 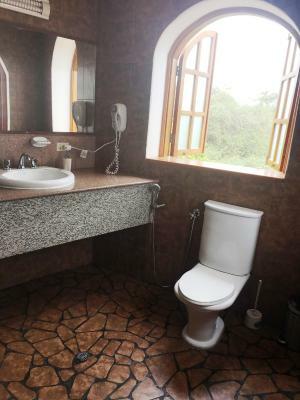 But this appears to be normal all throughout Galapagos. The location was a little bit retired from the pier area, and it was a little bit dark at night. But I must admit, we are talking about a 15 min walk, not terrible. It just becomes quite lengthy when you have to walk to town a couple of times in the day. I enjoyed my stay, good and easy access everywhere. 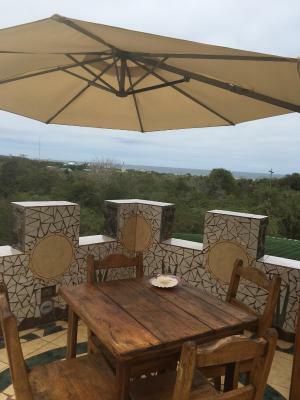 The only annoyance was mosquitos/bugs at the beach and everywhere, at Fortaleza we were fine bc we kept terrace doors closed from early evening and had ac. Bring bug repellent and thin long pants and shirts. This is typical of any tropical place. Other than bugs, everything was great! Wifi was non-existent most of the time - but that is the island rather than the accommodation. The wifi isn't exactly the best around the whole island of Santa Cruz. 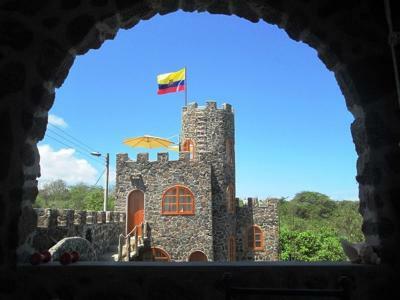 The location of this fortress may seem away from the main streets, but it is actually a short 10-15min walk away only. 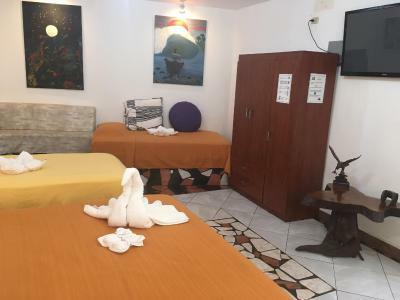 The transfer from the Airport by itself was already a long journey - arriving at Baltra Airport > Free shuttle bus to the port > 10min ferry ride (USD1) > 45min public bus ride (USD2) or you may opt for a taxi). If you have your google map loaded or know the locations, you may ask the public bus driver to allow you to alight anywhere along its journey. 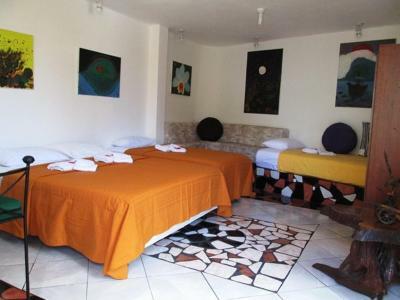 Otherwise, it is a 5min ride (USD1.50) from the pier of Puerto Ayora. 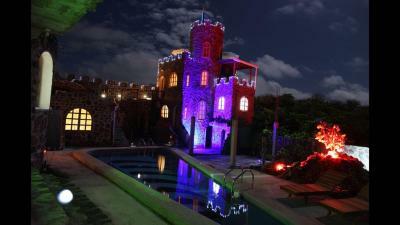 The design was definitely something that caught our attention and we think the followed their theme of building a castle very well indeed. My wife and I stayed for 2 nights and we first booked the Familiar Room (which had extra beds) and found the room small (hardly had any space to open our luggage), but as guests had vacated on the next day, the hosts provided a very kind gesture to upgrade us to the Quadruple Suite as they found out we were on our honeymoon! The upgrade gave us the much needed space to repack our luggage (after our 6D5N cruise around the islands) and the toilet was very impressive as well! The breakfast provided was very good! A little bit out of town. We stayed in two different rooms. The first one was very large, but had wasps. 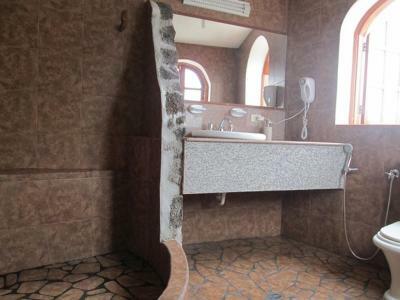 The second was very cramped, but a great shower, and smelled horribly of moth balls. They have a storage closet in there, so my guess is they use the moth balls in there? Super friendly hosts. Arranged a great boat tour for us. The owner was really lovely and welcoming. She took time to suggest things we could do with our free time and her restaurant recommendations were really great. 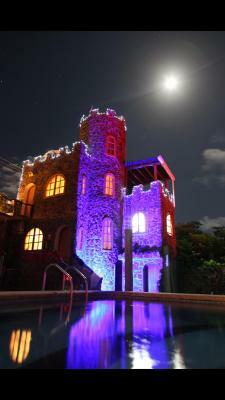 We had the room in the castle (Sun & Moon Room) and it was really great and private. I loved having the little balcony with the hammock AND the separate roof terrance which was a great spot to lie in the sun and read.